4 bedroom house split over two levels just a walk up from the beach. Our lovely, newly renovated beach house is split over two levels. Upstairs, we have two very large bedrooms and open living area with modern kitchen, light-filled stunning dining space and a comfortable sitting area with 49” Sony Smart TV. 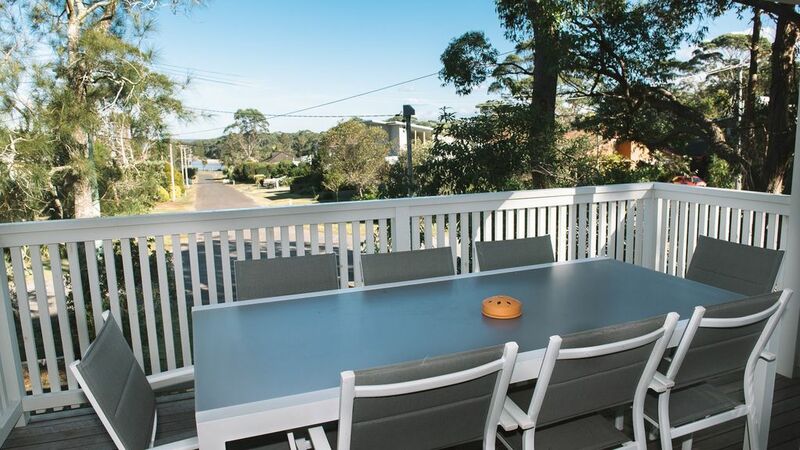 The full width front balcony with outdoor dining area has views to beach inlet (5 minute walk to beach); the full width back balcony with sitting area has views into the National Park. Downstairs, you will find a further two bedrooms and spacious second living area with bar fridge, tea-making facilities, seating area and TV. There are DVDs and videos for all ages, books and games, and warm welcoming spaces in which to enjoy them. You can enjoy the fine art works by local artists hung on our walls - and if you like them, you can even buy them - see the catalogue in the house. Please note that we do not accept bookings from party groups; and unfortunately we cannot accommodate pets as we do not have fences. The lagoon is great for swimming at high tide, and wading/paddling at low tide. You can get to Berrara Beach by walking through the lagoon at low tide. Or you can walk or drive around the road to the caravan park, where there is an entry to the beach. The beach is NOT patrolled. If you walk round the headland to the left of the lagoon mouth, you will find great rocks to explore, with views back to the headland of Jervis Bay, and Cudmirrah Beach, which is also lovely. There are many magnificent bushwalks in the neighbourhood. One starts on the bush road at the back of our property – turn left, follow it to a major fork, and turn left again until you reach Fisherman's Rock at Berrara Creek - this takes about 15-20 minutes. From there, walk back along the creek (there is a track) to the playground at the reserve (another 15-20 minutes), or continue on a round trip of 10 km, returning via Berrara Beach. The map for the 10km walk is on a board at the playground. For other challenging walks drive to Booderee National Park or Pigeonhouse Mountain. More information in Huskisson or at Booderee. The fishing here, and all around, is great . The Cuddy Café at Swan Lake (at Cudmirrah) sells good coffee, wood fired pizza, newspapers and basic groceries. There is a Coffee Cart near the beach – also good. You can also get basic groceries from the General Store on the Springs Road. On Sussex Inlet Road, you will find a strawberry farm and several other farms selling local free range eggs and fruit and vegies. Sussex Inlet (10 minutes) has serious shops and also boasts boats, canoes and kayaks for hire, a small cinema, and food cooked for you by others. There is a sports centre including an indoor 25m pool, tennis courts and soccer fields. At Huskisson (¾ hour), catch a dolphin cruise or a fishing charter through Jervis Bay, or visit the Aboriginal cultural centre/museum. There is a lovely open air public swimming pool and paddling pool for the kids. Then there are all the other magnificent beaches and water systems within easy driving distance – from Shoalhaven Heads (one hour) to Bateman’s Bay (1¼ hours). Try Callala Beach or Green Patch (one hour), or Bendalong, Conjurong Point, Lake Conjola or Mollymook/Narrawallee (¾ hour). At Burrill Lake (one hour), you can catch a very informative and peaceful lake cruise or fishing charter with Burrill Lake Cruises. There is excellent horse riding at Valhalla, Falls Creek (south of Nowra). For antiques and a bit of country culture, drive to Berry or Milton (one hour, in opposite directions), or further inland to Kangaroo Valley (one hour – you’ll also find horse riding and canoeing there) or the Southern Highlands. Milton, Mollymook and Ulladulla also have excellent restaurants for that special afternoon or night out. Both bathrooms are spacious and modern. Sea Shack is just up the hill from one of the most beautiful beaches on the south coast of New South Wales in Australia. Perfect for a for a break from Sydney or enroute from Sydney to Melbourne. From the front of the house you look down to beautiful Berrara lagoon. Off street parking in the driveway. Not undercover. Modern spacious kitchen with dishwasher. Sea Shack is located in beautiful Berrara which is one of the best swimming spots in Australia. You have the surf, the lagoon (very safe for young children) and the lake and with all having different aspects that means that in any weather there is a sheltered place to swim and sunbake.